Watch as the parrots sing, laugh, mimic sounds, solve problems, create artwork and more! 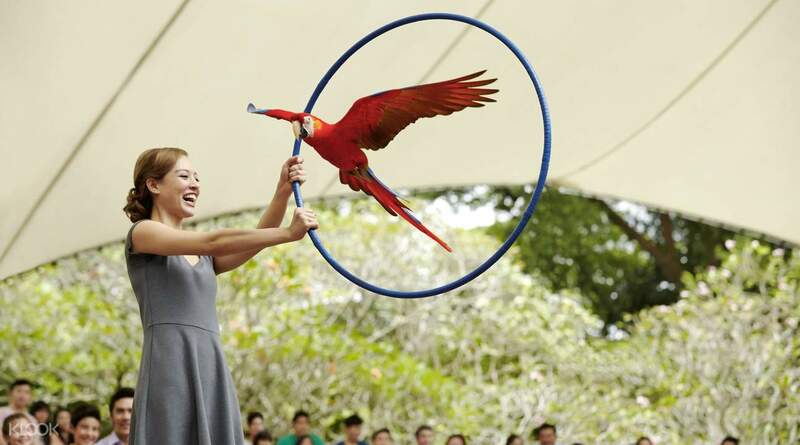 Enjoy an abundant spread of Asian cuisine and be amazed by a stunning show from talented feathered performers. 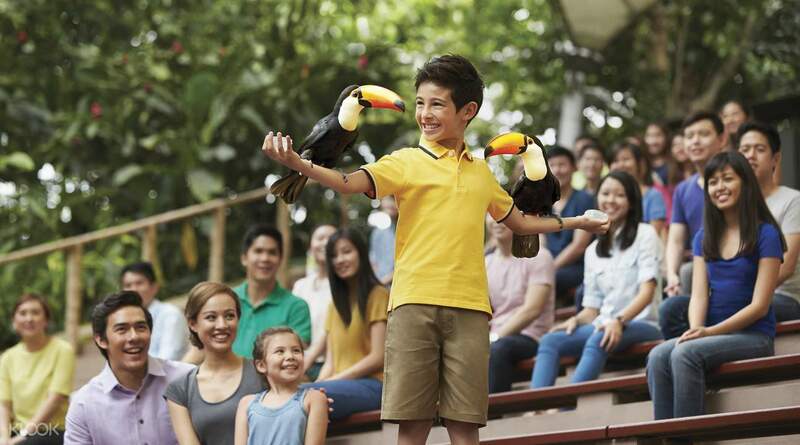 You will get to see marvelous tricks that go way beyond voice mimicking: the parrots at Jurong Bird Park can solve puzzles, sing songs and even paint. Why just grab a quick sandwich on the go when you can pair your lunch with an amazing experience and a fun time for the whole family! 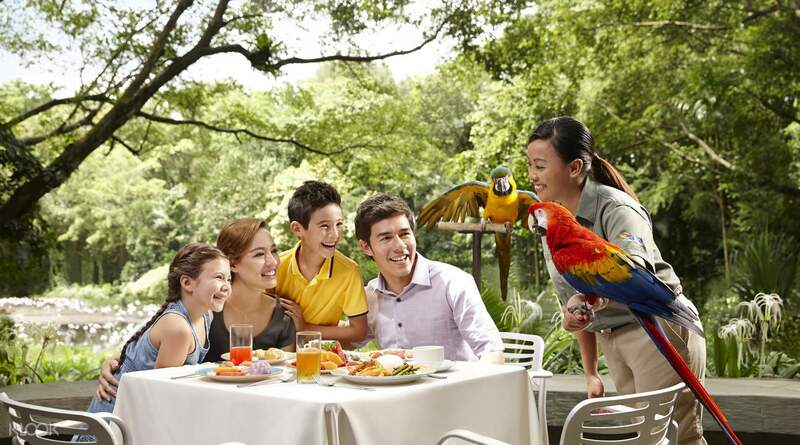 Feast on sumptuous Asian dishes such as stir fried prawns, Singapore laksa, sweet and sour fish and an array of delectable desserts, and take home memorable snaps from your time dining with the birds! It's a very pretty and cute experience to have lunch whilst gorgeous Macaws display their performance! More than the lunch we enjoyed the parrots art and the trainers work which they put on a daily basis for this performance! It's a very pretty and cute experience to have lunch whilst gorgeous Macaws display their performance! More than the lunch we enjoyed the parrots art and the trainers work which they put on a daily basis for this performance! I would highly recommend Klook for booking the attractions pass. 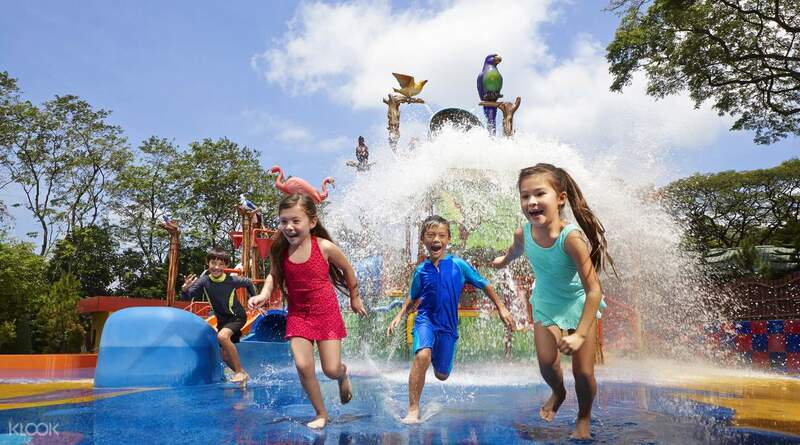 Offers great discounts on all passes and it’s easy to redeem! I would highly recommend Klook for booking the attractions pass. Offers great discounts on all passes and it’s easy to redeem! The lunch with parrot gave us the view of the parrot show. The lunch with parrot gave us the view of the parrot show. My daughter loved the experience. She had a one on one interaction with the Parrots. 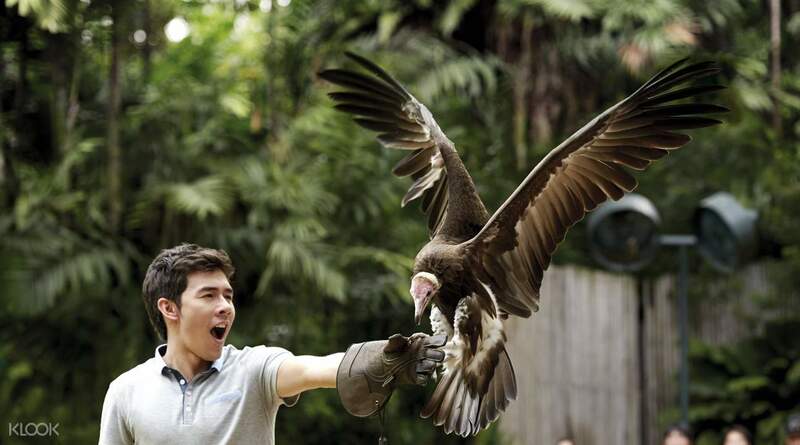 The birds were well trained & hosts friendly. Lunch was ok ok. Would recomend the experience as a whole. My daughter loved the experience. She had a one on one interaction with the Parrots. The birds were well trained & hosts friendly. Lunch was ok ok. Would recomend the experience as a whole. We get to take photos with the birds while they are on our hands. But we need to buy the parrot painting at $10 and then take a photo with the birds. The food is not nice. The coffee was not replenish. Not enough glasses and cups for the guests. Dessert was just okay. We get to take photos with the birds while they are on our hands. But we need to buy the parrot painting at $10 and then take a photo with the birds. The food is not nice. The coffee was not replenish. Not enough glasses and cups for the guests. Dessert was just okay. it was really a great experience. ticket redemption very easy at kiosk. food was ok. it was really a great experience. ticket redemption very easy at kiosk. food was ok. Received e-voucher within 1 day of order but surprised that it is indicated "For Tourist only" on the voucher. Was a little bit concerned since I am a Singaporean but easy collection at the automated ticketing machine and used ticket without any hiccups at all. 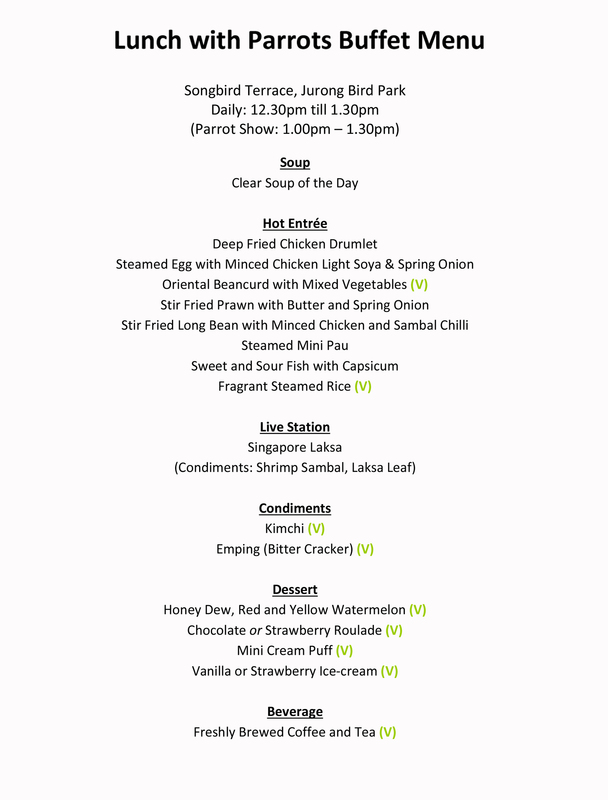 Buffet food item below average but food cost very expensive in Bird Park itself hence still considered a good deal in Bird Park given food+bird show. Nevertheless, service by staff were excellent. Will definitely buy again since only cost $16 per pax! Received e-voucher within 1 day of order but surprised that it is indicated "For Tourist only" on the voucher. Was a little bit concerned since I am a Singaporean but easy collection at the automated ticketing machine and used ticket without any hiccups at all. Buffet food item below average but food cost very expensive in Bird Park itself hence still considered a good deal in Bird Park given food+bird show. Nevertheless, service by staff were excellent. Will definitely buy again since only cost $16 per pax!